This cover is a no-drill installation and can be installed or removed in minutes with only a Phillips head screwdriver and 7/16 inch wrench. This allows quick full bed access for hauling larger items. With a compact canister and a no-drill installation, the Switchblade takes up less space in your bed. It can also be easily removed in minutes for full bed access. The Switchblade does a great job in funneling out any water that enters the bed through channels in the mounting rails. Excess water runs out of the truck bed via drainage tubes. With a gentle push, the Switchblade cover retracts into the canister with help from the Continuous Tension Spring. This ensure smooth operation, giving you easy access into the truck bed. Closing the Switchblade cover is just as easy as opening it. Just pull the convenient strap and your bed is covered in seconds. The Pace Edwards Switchblade tonneau cover is designed with a continuous tension spring that allows the cover to roll into the canister smoothly. The full width handle allows the cover to be opened from either side of the truck bed. To close the cover, use the provided pull strap to pull the cover shut. With its low-profile design, the Switchblade cannot be locked open every 12" like some of the other Pace Edwards models. The Switchblade is constructed of aluminum panels bonded with Pace's patented ArmorTek, which is a padded weather resistant polymer that adds extra durability. 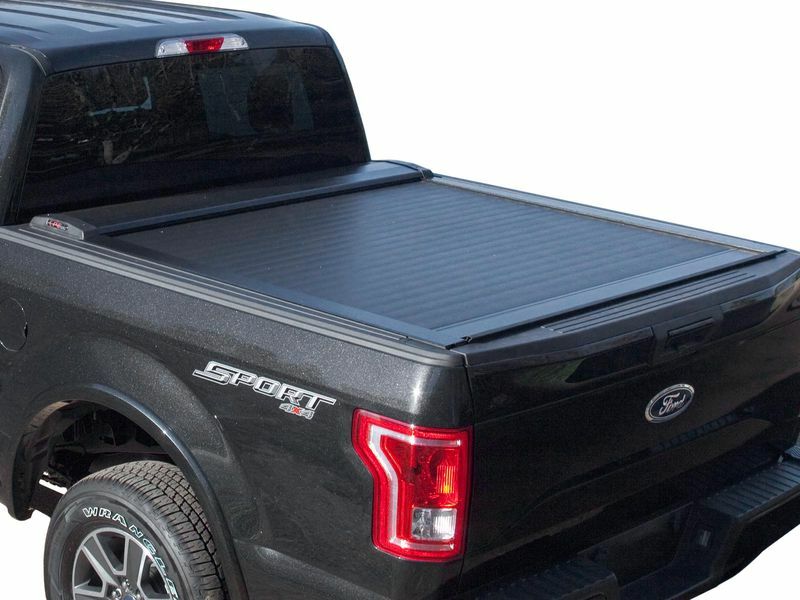 This layer is attached right to the aluminum panels and gives the truck bed cover a soft top look and feel without compromising on security. You have no reasons to doubt that this cover will withstand the tests of time through any elements. Installation of the Switchblade is like no other cover in its class. The only tools you need are a 7/16" wrench and a Phillips head screwdriver. Pace Edwards designed the canister to be easily removed or installed in minutes. So whether you're protecting your truck bed, or need 100% full bed access, the Switchblade can easily accommodate both options. Some models may require drilling to install the drain tubes. Pace Edwards Switchblade tonneau cover comes with all necessary hardware needed for installation. Each cover is specifically made for your truck, meaning everything is going to line right up. Also, there's no need to drill while installing this truck bed cover. Only tools needed is a 7/16 wrench and a Phillips head screwdriver. If you have any questions, don't hesitate to give RealTruck a call at 877-216-5446.